After surviving a March 2016 death hoax, last surviving adult Wizard of Oz Munchkin Jerry Maren has died for real, at age 98. THR reports he passed away sometime in May. He had reportedly been dealing with dementia. His death came in the same year as that of Dorothy Barrett, who had a bit part in the iconic 1939 film. As of now, the only known survivors from the fantasy epic are Priscilla Montgomery (b. 1929), Betty Ann Bruno (b. 1930), Ardith Dondanville (b. 1930), Joan Kenmore (b. 1931), Valerie Lee (b. 1931) — all Munchkin children; Ambrose Schindler (b. 1917), a Winkie; and Judy Garland's (1922-1969) dance stand-in from the film, Caren Marsh (b. 1919). 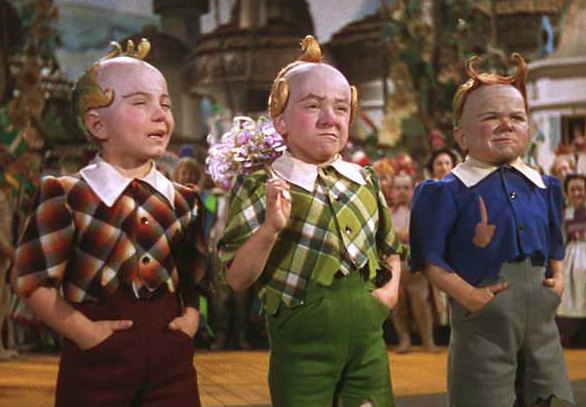 We represent the Lollipop Guild/And we welcome you to Munchkinland! He had a long career, making his uncredited film debut in The Terror of Tiny Town (1938) and playing a mime in 2010's Dahmer vs. Gacy, his final role. In-between, he almost always played roles along the lines of "Santa's Elf" or "Midget," with highlights including playing a "Child Ape " in Planet of the Apes (1968), Boris/Rah-Rah on the 1971 kids' series Lidsville, and recurring roles on Mary Hartman, Mary Hartman (1977) and No Soap, Radio (1982). He referenced his iconic Oz status by playing a hotel guest in the 1981 dud Under the Rainbow, which used a rowdy group of Munchkins shooting Oz as part of its farfetched plot. Maren made many other TV appearances, including tossing confetti on The Gong Show in the '70s, and had other odd jobs in entertainment, including playing the Hamburglar and Mayor McCheese for McDonald's. February 12, 2013, was proclaimed "Jerry Maren Day" in L.A.
Maren, who was memorialized this past weekend in Hollywood, was preceded in death by his wife, Elizabeth Barrington (1941-2011).